The Master of Science in Software Engineering trains individuals to successfully design, develop, implement, integrate, and maintain software and software related products. Since coding is only one phase of the software life cycle, St. Mary’s program does not focus on teaching specific languages. Instead, we give students the knowledge and skills necessary to develop and manage large-scale software systems with a primary focus on quality, reliability, and maintainability. We emphasize skills in managing development processes, organizational structures, analysis and modeling techniques, design methodologies, documentation standards, and quality controls. Thesis option: 24 credit hours of coursework plus 6 credit hours of thesis direction. The thesis must be defended orally. Project option: 27 credit hours of coursework plus 3 credit hours for a Capstone Master Project. The Capstone Master Project must be presented and defended orally in front of the master project committee. Combined degree: earn both a Bachelor’s and Master’s degree in Software Engineering in just five years. Students must begin this plan during their freshman year in order to complete all of the requirements in this timeframe. 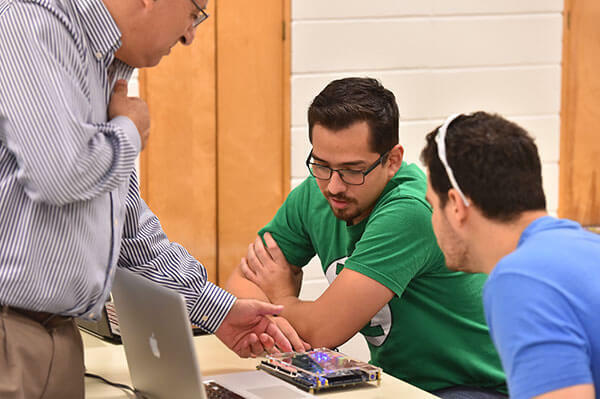 Students who complete the Master of Science in Software Engineering program at St. Mary’s are prepared for rewarding careers in the field of software engineering. Graduates have employment opportunities with companies that develop, manage and maintain software systems. They are employed by a variety of public and private institutions that design, evolve and reengineer complex software systems. They have career opportunities in every field where software programs are created and maintained. Admission is granted only to those with a high promise for success in graduate study, as demonstrated through previous academic records and testing. Have a bachelor’s degree in Software Engineering, Computer Science, Computer Engineering or a closely related discipline. Applicants who earned a bachelor’s degree from other disciplines may be admitted with the provision that they take the prerequisite courses listed below. The Graduate Program Director will evaluate these cases on an individual basis. Have a minimum Grade Point Average (GPA) of 3.00 (A = 4.00) for their bachelor’s degrees. Have a minimum GRE quantitative score of 148. Applicants who fail to meet any of the above standards may be admitted on a conditional basis. The graduate program director evaluates these cases on an individual basis. International student must submit the TOEFL scores and show a minimum of 80 in the Internet-based test or 213 in the computer-based test or 550 in the paper-based test. As an alternative to the TOEFL, International Student can take the IELTS test and show a minimum score of 6.5 or better. A score of 6.0 is acceptable with the provision that the student takes EN6301 during the first semester at St. Mary’s University. No student will be admitted with a score lower than 6.0 in the IELTS test.